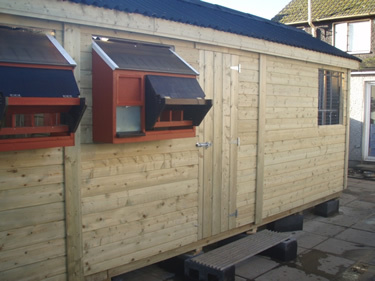 The Pigeon Loft is made from Pressure Treated Shiplap Timber and has an Onduline Roof fitted. The Onduline Sheeting carries the manufacturers 15 year Guarantee. Clear Perspex Sheets can also be fitted giving Extra light within the Pigeon Loft. Box Profile of Tile Effect Sheeting can also be fitted. Internal Partitions with Sliding Doors can also be supplied and Fitted. Also available in Base Coated Shiplap. We also provide an Assembly Service - email or phone us for a price.